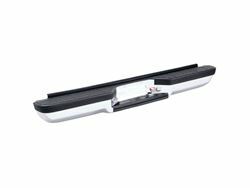 Feys Perfect Match Rear Step Bumper line-up provides the Perfect alternative to OE bumper replacements. Feys Perfect Match Rear Step Bumper line-up provides the Perfect alternative to OE bumper replacements. Made of stamped, formed steel and V5 tested for strength. Featuring molded polymer OE style step pads, face pads and hitch pads. Choose your finish in durable black powdercoat or brilliant chrome plating. All applications ship as a complete assembly including face bar, pads, light assemblies, brackets and mounting hardware.